My local Homebase is closing down other than the usual 80 - 90 % off i saw this on the wall not something im interested in but thought maybe someone else would be. Available from the 19th of july. Will require professional removal not sure why to be honest. Which store is this in @Zoidberg2017 ? Spalding at a guess ?? Will need professional removal as it wieghs as much as a car I would hazzard a guess? ONO? Is this really the store selling them? Considering the store is closing, yes. 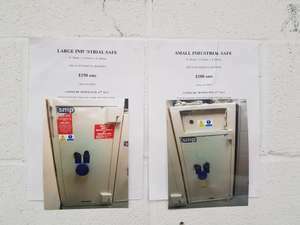 These are the stores own safes not a stock item. All the fixtures and fittings are likely up for grabs.